Once in a while, we make scientific discoveries in which the truth seems stranger than fiction. SN Refsdal, discovered last November by astronomers working on the Grism Lens-Amplified Survey from Space (GLASS) program is one of these. Named after Norwegian astrophysicist Sjur Refsdal, SN Refsdal is the first gravitationally-lensed supernova that has been found in multiple images. Its namesake outlined the usefulness (the Refsdal method) of such a discovery in determining the Hubble constant in 1964. 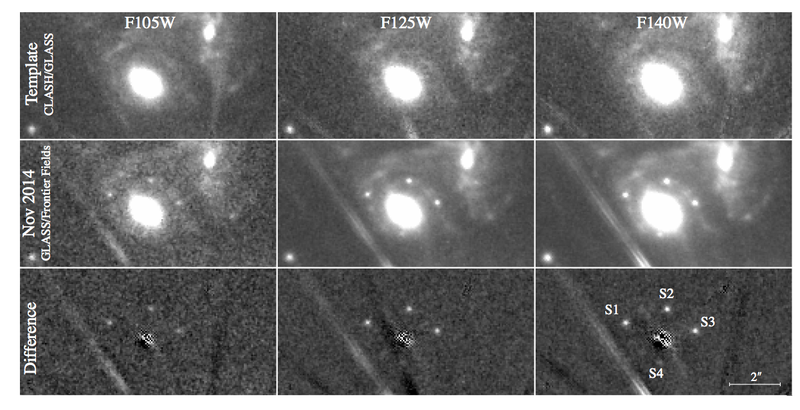 Figure 1: HST WFC3-IR images showing the appearance of four point sources (labeled S1, S2, S3, and S4) around a massive elliptical galaxy in the MACS J1149.6+2223 cluster. The point source is believed to be an SN nicknamed “Refsdal”. The top row is the archival WFC3-IR imaging from December 5, 2010 through March 10, 2011. The middle are composite images from November 3-11, 2014 (left), November 20, 2014 (middle), and November 10-20 (right) that show four point sources that were not present in older images. At first glance, a SN Refsdal (shown in Figure 1) might not seem particularly interesting (or strange). After all, it wasn’t unexpected, like Vera Rubin’s flat galaxy rotation curves, nor is a multiply-imaged object exactly new (gravitational lensing has already been discussed in previous astrobites) and it also doesn’t quite have the pop-culture application of something like Kepler-16b. To see why this is such a big deal, we have to look at the context of its usefulness in measuring one of the most important numbers in cosmology. Though complicated in practice, the Refsdal method for determining the Hubble constant (which measures the expansion rate of our universe) is relatively straightforward in theory. Gravitational lensing occurs when matter between a far-away source and the observer (the gravitational lens) causes light to bend on its way to the observer. In the case of strong gravitational lensing, there can be so much mass in front of the source that we end up seeing multiple images of the lensed object. When an object, say, a supernova, is strongly-lensed by a massive object, the light from the supernova can follow different paths on the way to the observer, thus producing different images. These different paths that the light can traverse, however, will also produce time delays among the images themselves. In addition to being dependent on the gravitational potential of the lens, these time delays are also inversely proportional to the Hubble constant and also weakly dependent on other cosmological parameters. Thus this idea is so attractive because it provides a way for us to measure the Hubble constant without the use of a distance ladder. Supernovae are transient events, with a duration usually on the order of days, making the time delays between their images much easier to measure. Because the gravitational lenses can produce time delays on the order of months or years, we can actually see the supernova appear and disappear at different times in different images as the light from each eventually reaches us. In contrast, if we found multiple images of an object whose flux doesn’t change over time, it would be harder to know what the time delays among the images are. Astronomers have previously attempted to determine the Hubble constant using the Refsdal method from strongly-lensed quasi-stellar objects (quasars), but they have much more complicated light-curves and require more monitoring. Supernovae, on the other hand, change quickly and have simpler light curves, making them ideal for this analysis. While this helps with the measurement of the time delays, the lens models themselves are another major source of uncertainty since different models can produce the same image. Since a model of the gravitational potential is necessary to understand the time delays, most of the time, the uncertainties in the lens models will dominate the uncertainty in a measurement of the Hubble constant with this method. Figure 2: A color-composite (optical and infrared) image of the MACS J1149.6-2223 galaxy cluster. The white lines are the critical curves (lines of infinite magnification) for objects at the redshift of the host galaxy of Refsdal (z=1.49). There are three images of the host galaxy, marked as 1.1, 1.2, and 1.3. The group’s lens models indicate that Refsdal appeared in image 1.3 in the past and will appear in image 1.2 sometime in the future. 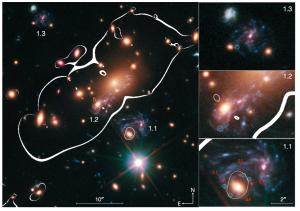 In the third image of the host galaxy, 1.1, we can see that Refsdal has been imaged four times and appears as an Einstein cross around the elliptical galaxy in the foreground. SN Refsdal was found in the field of the galaxy cluster MACS J1149.6+2223 on November 11, 2014. The four images discovered of the supernova are separated by more than 2 arcseconds–enough for them to be clearly resolved–and are in the formation of an Einstein cross around a massive elliptical galaxy (in the foreground). This galaxy (located at a redshift of z=0.54), and the galaxy cluster that it is a part of, are both believed to contribute significantly to lensing Refsdal and its the spiral host galaxy, which results in the multiple images of both the supernova and its host galaxy. The four point sources identified as SN Refsdal are labeled as S1, S2, S3, and S4 in Figures 1 and 2. The authors state that their lens models indicate that it’s likely that S1 is the first image, followed by S2, S3, and S4 retrospectively (however the ordering is tentative as different models disagree a bit about the ordering). In Figure 2, the four points sources, labeled in red, along with another source that was quadruply-imaged, circled in blue, can be seen in image 1.1 of the host galaxy. 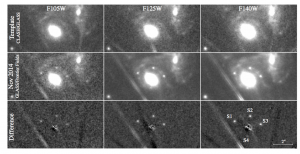 Perhaps more interestingly, the lens models also predict not only the order in which the images of the SN appeared in that particular image of the host galaxy, but that the SN has also appeared previously in different image of the spiral host galaxy and will appear in the future in yet another image of the host galaxy. So when will this future image of SN Refsdal appear? Sometime between 2015 and 2025. With a ten-year window, there are clearly a lot of uncertainties involved in modeling this system, which observing the next image would help constrain. As mentioned earlier, the timing delays also depend on both the Hubble constant (and other cosmological parameters) and the gravitational lens models used. These degeneracies will still make it tricky to get an accurate measurement of the Hubble constant with this method. But in the meantime, in addition to giving us something to look forward to, SN Refsdal also demonstrates the potential usefulness of carrying out experiments like the one Sjur Refsdal suggested 50 years before its discovery. Disclaimer: I work with some of the authors of this paper, but I was not involved with this research (I just happened to think it was cool).